This paper found that chiropractic adjustments were superior to muscle relaxants (and a sham procedure) in reducing pain, and were more beneficial than either placebo or muscle relaxants in reducing the Global Impression of Severity Scale. OBJECTIVES: To determine the characteristics of patients who take muscle relaxants for back pain after seeking care and to determine the relationship of muscle relaxant use with recovery from the episode of low back pain. SUMMARY OF BACKGROUND DATA: Low back pain is a common condition with a generally favorable short-term prognosis. Physicians in the acute setting commonly prescribe muscle relaxants. The indications for use and outcomes are not clear. METHODS: We performed a secondary data analysis of a cohort of 1633 patients who sought care from a variety of practitioners (primary care, physician of chiropractic, orthopedic surgeon, Health Maintenance Organization) for low back pain. Patients were enrolled in the physician's office and interviewed at baseline, 2, 4, 8, 12, and 24 weeks. Pain, functional status, medication use, health care utilization, and satisfaction with care were assessed. RESULTS: Muscle relaxants were used by 49% of patients; among those who sought care from doctors, 64% used muscle relaxants. Muscle relaxant users were more impaired at baseline. Over time, among patients with greater functional status impairment (Roland disability score > 12) at baseline, muscle relaxant users had somewhat slower recovery from the episode of back pain. This finding persisted after controlling for baseline functional status, age, worker's compensation status, and use of nonsteroidal inflammatory agents. CONCLUSIONS: Use of muscle relaxants was very common among patients with acute low back pain. 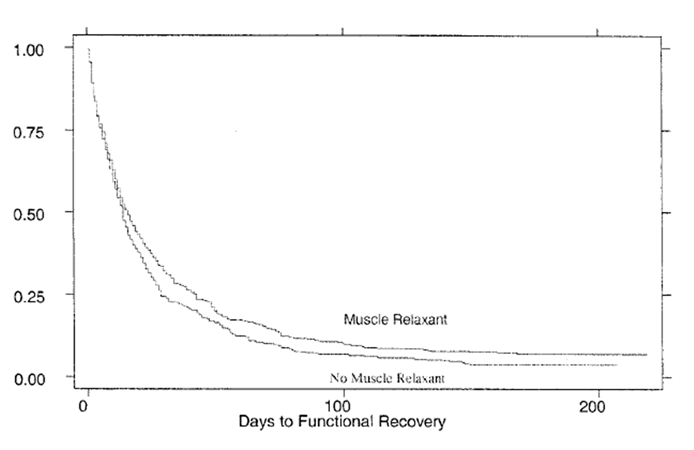 Muscle relaxant use was not associated with more rapid functional recovery. Acute low back pain (LBP) is a common and disabling condition. For people under the age of 45, back pain is the most common cause of activity limitation. Approximately 1% of the population is chronically disabled due to back problems, and another 1% is temporarily disabled. Although most individuals with acute back pain manage the problem without availing themselves of the care of health professionals, over a third of those afflicted with acute LBP do seek care from a health care provider, most commonly amedical doctor (MD) (allopathic) provider. This accounts for 15 million physician visits per year and an estimated cost of $192 million in 1990. Low back problems are the second most common cause for office visits to primary care physicians, and back pain is the most common reason for office visits to orthopedic surgeons, neurosurgeons, and occupational medicine physicians. It ranks third among indications for surgery. The content of the care provided by these allopathic physicians consists of evaluation, reassurance, advice regarding activities, physical methods, medications, and surgery. The most common medications prescribed by MDs are nonsteroidal anti-inflammatory drugs (NSAIDs), muscle relaxants, and narcotic analgesics. A recent observational study in a managed care setting showed that of patients treated for back pain 69% were prescribed NSAIDs, 35% muscle relaxants, and 12% narcotics. The use of muscle relaxants has been examined in multiple randomized controlled trials, but their utilization and effectiveness in community practice has been relatively little assessed. The role of muscle spasm in the pathogenesis of back pain and of muscle relaxants in its treatment have been a subject of dispute. Multiple agents are currently used for muscle spasm, including cyclobenzaprine, tizanidine, dantrolene, carisoprodol, baclofen, and benzodiazepines. Studies examining the use of these medications have generally been in efficacy settings: randomized trials comparing the study medication as a single agent compared with placebo. In general, these agents have been considered modestly efficacious, although there is considerable variability in individual studies designed to demonstrate their effectiveness. This may be due, at least in part, to the wide variation in the tests, treatments, and systems of quantifying back pain. This has resulted in a correspondingly diverse literature regarding back pain and the use of systemic muscle relaxants. Systematic review of this literature is essential to understanding its impact on current and future treatment practices. The comprehensive 1994 Agency for Health Care Policy and Research (AHCPR) review of treatments for LBP examined the use of muscle relaxants and considered them an acceptable option in the treatment of acute LBP. These guidelines reported that muscle relaxants were probably more effective than placebo, but that they have not been shown to be more effective than NSAIDs and that no additional benefit is gained by using muscle relaxants in conjunction with NSAIDs. This statement was supported by limited research-based evidence. A systematic review of randomized clinical trials (RCTs) published by van Tulder et al found “strong evidence” showing muscle relaxants were more effective than placebo and that different types of muscle relaxants are equally effective for acute LBP. This review did not address the effectiveness of muscle relaxants compared to, or in conjunction with, NSAIDs. The frequent use of muscle relaxants and the relatively modest strength of recommendation from the AHCPR guideline point to the need for further evidence regarding the utility of these medications in everyday clinical practice. Muscle relaxants can be sedating, may increase fall risk, and impair the ability to drive automobiles or operate machinery. There is also some concern relating to possible risk of dependency for benzodiazepine medications. Incremental effectiveness when other medications and treatment types are used remains unclear. Whether use of these medications is associated with improved functional status. Our study assesses the effectiveness of muscle relaxants in treating LBP in a generalizable sample of patients with acute back pain. The results of this survival analysis also raises questions regarding possible delay of functional recovery related to the use of muscle relaxants in this population. This will provide useful information in addressing the question of whether oral muscle relaxants, alone or in conjunction with NSAIDs, should be used to treat LBP. The North Carolina Back Pain Project is a collaborative effort between the Sheps Center for Health Services Research and the Departments of Medicine, Family Medicine, Biostatistics, and Business at the University of North Carolina. The data collected from this project already have provided information regarding outcomes of acute back pain and its relation to different types of practitioners,  provider self-confidence,13 and worker’s compensation. Additionally, the data have been used to better understand the utilization of diagnostic tests and physical therapy in the diagnosis and treatment of acute LBP. We have re-examined these data in an effort to better understand the relationship between muscle relaxant use and functional recovery from acute LBP. Methods for data collection in this study have been previously described by Carey et al and are outlined briefly below. The overall intent of the study was to examine the outcomes of processes of care for community-based individuals with acute LBP. We wished to enroll patients at the onset of care seeking and followed them with periodic telephone interviews for almost 2 years. We observed care as delivered and made no attempt to influence practice patterns. Practitioners were randomly selected from medical and chiropractic state-licensure files. Practitioners were recruited if they cared for self-referred acute LBP and practiced in an ambulatory care setting more than half time. A total of 208 (74%) eligible practitioners agreed to participate. These 208 providers were made up of 87 primary care practitioners, 64 chiropractors, 29 orthopedic surgeons, and 28 physicians, nurse practitioners, or physicians’ assistants in a group-model Health Maintenance Organization (HMO). In North Carolina, DCs are not permitted to prescribe medication, but nurse practitioners and physician’s assistants can. Each of the participating providers recruited sequential selfreferred patients presenting with acute LBP. English-speaking patients coping with an episode of back pain of less than 10 weeks’ duration who had not previously sought care for the current episode were eligible for the study. Exclusion criteria were pregnancy, past back surgery, known diagnosis of nonskin malignancy in the past 5 years, or lack of a telephone at home. Patients were told that the study’s purpose was to determine the duration of LBP and the types of treatments used. They were compensated $20 for their time to participate in the study. The compensation was funded through the federal research grant. Fifty percent of patients seen with back pain by the participating providers were eligible for the study. Chronic pain and previous treatment for the current episode of pain were the main reasons for ineligibility. Staff members in each practice kept a list of patients recruited for the study providing an accurate assessment of recruitment rates. Only 8% of patients who met these requirements declined participation in the study. Participants’ histories were recorded and physical examinations performed by practitioners during the initial visit. Staff of the Survey Research Unit (SRU) at the University of North Carolina at Chapel Hill contacted patients after the index visit with a median lag time of 7 days. Patients were contacted 2, 4, 8, 12, and 24 weeks after the baseline interview or until they felt that they were “completely better” if that was before 12 weeks. All patients were interviewed at 24 weeks, independent of recovery. Data were collected in a systematic fashion and recorded on computer-assisted telephone interview units and transferred to the Sheps Center for Health Services Research at the University of North Carolina for analysis. At each interview, patients were asked about prescription and nonprescription medications they had used since the previous interview. We queried patients regarding both classes of agents (“muscle relaxants”) and also regarding specific commonly used agents (“Flexeril, Soma. . .”). When a medication was not on the prompted list of most common muscle relaxants and other medications, they were asked to give the specific name. All medications were then later categorized by one of the authors (T.C.). Additional medications not in the prepared list were recorded verbatim and classified by one of the project physicians (T.C.). The primary outcome was return to a functional status equivalent to that before the onset of pain. At each interview, patients were asked if they had returned to functional status equivalent to one before this episode of back pain. If they answered yes to this question, the interviewer worked with the patient to determine the date on which the patient attained the status of returning to their previous functional status. Patients also were asked if they were “completely better” at each interview. Functional status was assessed initially and at subsequent interviews using the Roland-Morris adaptation of the Sickness Impact Profile, a 23-item validated scale specifically designed to assess loss of function due to back problems. This instrument was found to be the best available questionnaire for detecting change over time in patients with LBP. Patients were also asked at each interview if they had taken muscle relaxants, NSAIDs, acetaminophen, or steroids with prompting for specific medication names. Bivariate analyses were performed using 2 tests for comparing categorical variables to muscle relaxant versus no muscle relaxant use. The Student t test was used for the bivariate analyses of continuous variables. The log-rank test was used to compare time to recovery for the 2 muscle relaxant use groups. Previous analysis of this data set revealed similar recovery times for primary care practitioners, chiropractors, or orthopedic surgeons, so these provider types were not considered separately. Patients were enrolled in the study from June 1992 to March 1993. Time-to-recovery data were obtained for all 1,633 of these patients. The average age of patients in the study was 41.4 years (Table 1). Approximately onefourth of patients (24%) suffered from sciatica (pain radiating to the level of the knee or below). When asked to rate their pain on a 1 to 10 scale, the mean response was 5.4. The average baseline Roland score was 11.2. Of the 95% of patients who returned to their baseline functional status by self-assessment during the study time period, the mean time to functional recovery was 16.2 days with a median recovery time of 8 days from the index visit. Seventy-eight percent of all enrolled patients used NSAIDs, and 49% used muscle relaxants at some point during the study. Patients taking muscle relaxants were slightly more likely to be younger, female, on worker’s compensation, and to have had previous LBP treatment when compared to patients not on muscle relaxants (Table 1). Muscle relaxants were more commonly used by patients who initially sought care from MDs (63% at some point during treatment and 58% after the initial visit). Doctors of chiropractic cannot prescribe medication in North Carolina, but some patients who sought care from DCs did take prescription medications, presumably either prescribed by an MD without a visit, left over from previous care, or used a relative’s medication. Although the differences in pain at baseline are statistically significant, these differences are not considered clinically important. The patients taking muscle relaxants had significantly higher Roland scores. Of patients visiting a physician, 63% took a muscle relaxant medication during their episode of back pain, compared with 23% of those who selected a physician of chiropractic as their initial provider. Higher back-related disability as measured by the Roland scale was associated with muscle relaxant use among both patients of MDs and DCs. Baseline pain scores were similar between patients who did and did not use muscle relaxants, in both MD and DC strata. Nonadjusted Kaplan-Meier estimates were used to compare the rates of recovery of patients who took muscle relaxants with those that did not. The log-rank test revealed a statistically significant difference between these 2 groups (P < 0.001). The 2 groups might be expected to have a significant difference in recovery time due to their baseline characteristics. To account for the differences between groups, several Cox proportional hazards models were used. The first model was adjusted for Roland score at baseline, age, white or nonwhite race, education, the presence or absence of sciatica at baseline, subjective pain at baseline on a 1 to 10 scale, income, presence of back pain for greater than or less than 2 weeks before baseline, and worker’s compensation status. Age, race, and education were not confounders and were subsequently excluded from the model. The survival curves for this model are shown in Figure 1. These analyses use muscle relaxant use after the initial visit as the indicator of use. The hazard ratio (HR) associated with muscle relaxant use was 0.88 (95% CI 0.80–0.99). 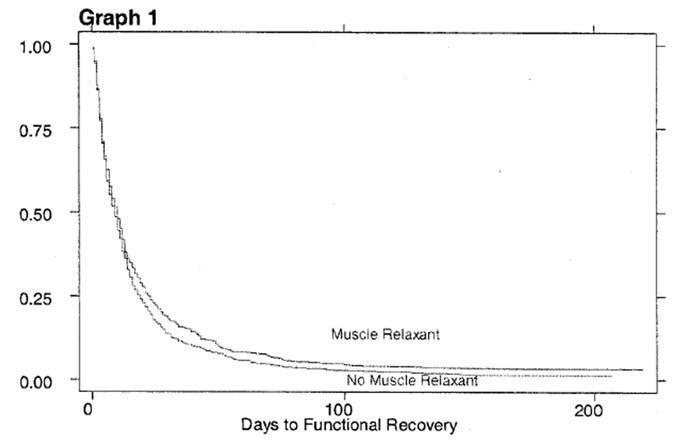 This ratio, illustrated in Figure 1, indicates that patients taking muscle relaxants, after controlling for baseline status, return to selfassessed ability to perform their daily activities more slowly than patients who do not take muscle relaxants. This could be related directly to these medications or to factors that may be indirectly related to muscle relaxant use that were not measured (greater time spent in bed after injury, increased likelihood of falls, etc.). In addition, we fit amodel to control for NSAID use in this population. This was done to determine if NSAID use had any effect on the difference in time to functional recovery for patients that used or did not use muscle relaxants. A dichotomous variable representing any NSAID use was added to the model. This gave a hazard ratio for muscle relaxant use of 0.89 (95% CI 0.80– 0.99). Controlling for NSAIDs did not affect the difference in time to functional recovery between the 2 muscle relaxant groups. The HR associated with NSAID use was not significant (HR = 0.94, 95% CI 0.83–1.07). A third set of models was fit to examine the effects of muscle relaxants in patients with moderate impairment separately from those patients with severe functional impairment from back pain. Two identical Cox proportional hazard models were used to evaluate functional recovery in patients with Roland scores greater than or equal to 12, indicating more severe functional impairment, and in patients with scores less than 12. The mean Roland score at baseline in this study was 11, so patients with scores of 12 or greater represent the upper 50%. In patients with Roland scores greater than or equal to 12, those taking muscle relaxants took longer to recover after controlling for baseline Roland score, subjective pain, sciatica, income, duration of episode before the initial visit (greater or less than 2 weeks), NSAID use, and worker’s compensation (Figure 2). The hazard ratio in this group was 0.81 (95% CI 0.69–0.94), which indicates that these patients took 19% longer to reach functional recovery than those patients that did not take muscle relaxants. The effect in patients with Roland scores less than 12 was not statistically significant (HR  1.02, 95% CI 0.88–1.19)). These individuals recovered at the same rate regardless of medication used. We also examined the Roland functional status scores adjusting for the same baseline variables for patients who did and did not take muscle relaxants. Similar scores were found at 2 and 4 weeks after baseline assessment with statistically significantly higher scores in the group taking muscle relaxants at 8-week and 12-week interviews. The difference in the Roland scores were on the order of 1 to 1.5 points, which is generally considered not to be of clinical significance. Therefore, the Roland scores also indicated little difference between the outcomes of patients who do and do not take muscle relaxants. A review of existing literature suggests there is some benefit from the use of muscle relaxants in the treatment of acute LBP as monotherapy and possibly in conjunction with NSAIDs. A recent meta-analysis of the cyclobenzaprine literature found consistent evidence of a moderate effect on pain, range of motion, and activities of daily living. There is a paucity of large, wellperformed RCTs in the literature. The existing studies comprise a wide chronological and methodologic spectrum. Some of the muscle relaxants used in early trials are rarely used today, and other newly available agents have not been used in clinical trials relating to back pain. The magnitude of this apparent benefit is unclear from the available evidence. In patients with severe acute LBP, as evidenced by a Roland score greater than or equal to 12, muscle relaxant use was associated with a statistically significant increase in time to functional recovery. Patients with worse symptoms at baseline were also more likely to receive the muscle relaxant medication. Although we did control for multiple prospectively assessed clinical and demographic characteristics, uncontrolled differences between the 2 groups may have led to patients with a worse prognosis being prescribed muscle relaxants and consequently having a worse clinical course. However, we found no evidence of benefit, which would indicate that a benefit, if present, is likely modest. In patients with less severe back pain, there was no demonstrable effect from muscle relaxant use. This held true even after controlling for Roland score, subjective pain, sciatica, income, duration of episode (greater or less than 2 weeks), NSAID use, and worker’s compensation. Systematic reviews have shown modest evidence for the use of systemic muscle relaxants in the literature. These reviews are, of course, based on existing RCTs, which generally compare muscle relaxants with placebo, not other active pharmacological agents. This large cohort study showed no evidence of benefit and even a delay in functional recovery for severely affected patients who take muscle relaxants in the setting of acute back pain. This cohort study should encourage development of better studies examining the effects of muscle relaxants and other drugs in the setting of acute LBP. Randomized trials conducted in community practice and in settings in which other commonly prescribed medicines are coadministered (such as acetaminophen and NSAIDs) may help practitioners to better understand the most appropriate role of this class of medications. A better understanding of their clinical effects in acute LBP is needed, especially taking into account the scope of the problem and the frequency of their administration. pain, even after adjusting for baseline variables. in addition to standard treatment confers incremental benefit. The authors thank Jane Darter and Anne Jackman for their generous assistance with this project. Seven chronic conditions: their impact on US adults’ activity levels and use of medical services. Am J Public Health 1995; 85:173–82. The epidemiology of spinal disorders. In: Frymoyer JW, ed. The Adult Spine. Principles and Practice. New York, NY: Raven Press; 1991: 107–46. Browning R, Jackson JL, O’Malley PG. Cyclobenzaprine and back pain: a meta-analysis. Carey TS, Garrett J, Jackman A, et al. by Primary Care Practitioners, Chiropractors, and Orthopedic Surgeons. Cherkin DC, Wheeler, KJ, Barlow W, et al. Medication use for low back pain in primary care. Hadler NM, Carey TS, Garrett J. The influence of indemnification by workers’ compensation insurance on recovery from acute backache. North Carolina Back Pain Project. Epidemiology and impact of low-back pain. Survival Analysis: A Self-Learning Text. New York, NY: Springer-Verlag; 1996. Electromyographic validation of pain relief: a pilot study in orthopedic patients. Am J Orthop Surg 1996;8:35–40. Mielenz TJ, Carey TS, Dyrek DA, et al. Physical therapy utilization by patients with acute low back pain. Riddle DL, Stratford PW, Binkley JM. Sensitivity to change of the Roland-Morris Back Pain Questionnaire: part 2. A study of the natural history of back pain. Part I: development of a reliable and sensitive measure of disability in low-back pain. Smucker DR, Konrad TR, Curtis P, et al. Practitioner self-confidence and patient outcomes in acute low back pain. Stata Statistical Software: Release 5.0. College Station, TX: Stata Corporation; 1997.
van Tudler MW, Koes BW, Bouter LM. Conservative treatment of acute and chronic nonspecific low back pain. A systematic review of randomized controlled trials of the most common interventions. Joines JD, Hertz-Picciott I, Carey TS, et al. A spatial analysis of country-level variation in hospitalization rates for low back problems in North Carolina.